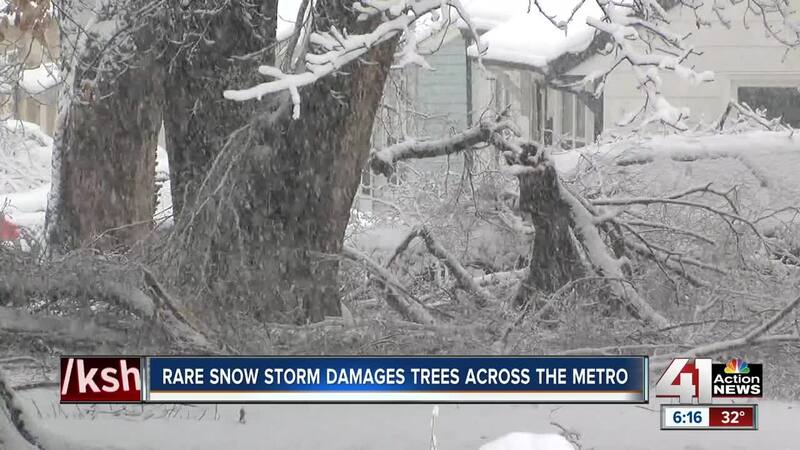 Will weekend snowstorm bring even more damage to trees in Kansas City? KANSAS CITY, Mo. — On Oct. 22, 1996, 4 to 8 inches of wet snow fell in the Kansas City area, collecting on trees and causing thousands to lose power. It would be 8,117 days until that much snow brought trees and power lines down again. On Saturday, Kansas City received 4 to 12 inches of wet snow and no wind, which allowed almost 4 inches of snow to collect on every branch and twig in Kansas City. The weight of the snow broke tree limbs, which then hit power lines and caused thousands to lose power. On top of downed tree limbs , power lines also snapped due to the weight of the snow. Around 1 inch of snow weighs about 1 pound per square foot. A medium-sized tree, about 30 to 40 feet, has around a 900-square-foot canopy. This means that during last week's snowstorm, a tree of that size held about 3,600 pounds of snow, or nearly 2 tons. Trees across the area were left broken, bent and battered. But will those bent branches bounce back? "In most cases they’ll pop back," said Paul Weaver, an arborist and owner of Tree Doctor in Kansas City, Kansas. "I actually have a birch tree in my backyard that a couple of days ago was bent almost all the way over to the ground, and after today’s snow drop, little bit of wind, melting, it’s almost back up all the way." The next winter storm, which will arrive Friday night, will bring different problems than the previous storm. The 41 Action News weather team is forecasting more wind and drier snow, which means there should be less snow on trees. But according to Nick Wilcox of Cartwright Tree Care in Grandview, "limbs that still are hanging and split, if we get 30 to 40 mile-per-hour winds, we’re definitely going to see more damage that what we got right now. "It’s just hand and fist with what we are dealing with," Wilcox said. To mitigate the damage from ice and snowstorms, Wilcox said it's important to trim trees for weight reduction before winter. Both Wilcox and Weaver said that people should try to take the weight off the end of branches while keeping their structure, which means taking limbs off the end of branches.